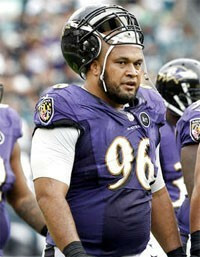 Ma'ake Kemoeatu was born January 10, 1979 and is a Tongan professional American football defensive tackle for the Baltimore Ravens of the National Football League. He was signed by the Ravens as an undrafted free agent in 2002. He played college football for the University of Utah Utes. Kemoeatu has also played for the Carolina Panthers and Washington Redskins. He is the older brother of NFL offensive lineman Chris Kemoeatu, and is one of several Tongans currently playing in the NFL. On May 2nd, 2012, Kemoeatu returned to the Baltimore Ravens. After a one-year hiatus from football, he lost 78 pounds, from 415 down to 337, in a serious attempt to resurrect his career. He wound up winning the starting nose tackle job from Terrence Cody, starting 13 games, recording 29 tackles, 1 sack and 1 forced fumble. He also got his first championship title when the Ravens won Super Bowl XLVII over the 49ers. Football stars such as a Ma'ake Kemoeatu have taken the game to new heights by excelling at their respective position. The booking agents at AthletePromotions can assist with Ma'ake Kemoeatu speaking engagements or appearances from NFL stars. We have years of experience in booking gridiron greats for keynote speeches and autograph signings. Hiring a football speaker like Ma'ake Kemoeatu is not a hard process. Our agents can provide availability, fees and all costs associated in bringing out a successful football star to your next corporate event. We can find Ma'ake Kemoeatus agent to make this booking happen. A Ma'ake Kemoeatu appearance will add energy to your upcoming event and reward employees, customers and clients.Most likely, football fans and corporations can find Ma'ake Kemoeatu's official website, charity involvement, Twitter account, representation, publicist and management info at www.Ma'ake Kemoeatu.com.